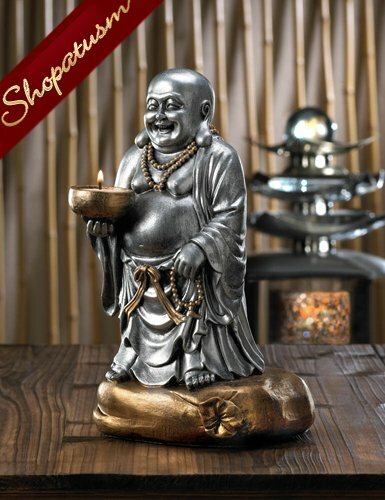 This is for a Standing Buddha Centerpiece Silver and Bronze Candle Holder from Shopatusm. He's finished in shimmering silver with bronzed accents, and the candle bowl he holds awaits the tealight candle of your choice. Item weight: 2.8 lbs. 8 inch x 6 inch x 11 3/8 inch high. Resin. Candle not included.